After a comfortable first night on Kenmor, I awoke early, excited about our adventures truly beginning today. 7 am, first, try and work out how to set up and write up a blog using iPad entirely. I'm still trying to get used to this iPad2. I find it is a tricky machine to learn. There are moments when I wonder if I should use Thomas Roche's method of fountain pen and ship's paper journal. However, it is a gift and I love its portability and challenge to be a sort of master of it. So here is the ship's blog revealing itself as Claire slaves away preparing tea and breakfast. I wonder how 1927 this is?Another warm sunny day, well hot sunny day for Ireland, back to the 20sC and 70sF very soon. 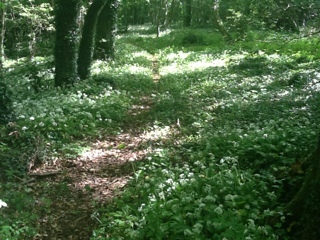 First, I took some daylight pics of that white mass of garlic flowers in the forest by the marina. 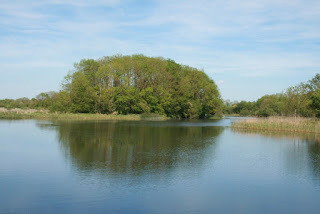 On the reed beds between the forest and the Shannon river I took a video of a reed warbler warbling. I will look at that and maybe edit this evening. Very meditteranean, still blue water, lots of sun, heat, and no other boats which is a surprise. Several herons and cormorants, but have not been able to take any pics of them yet. 1:20 pm arrived at Portumna town for a fuel fill up, everyone is at lunch. so we had lunch too. 2:50 pm, the fuel person returns from lunch. 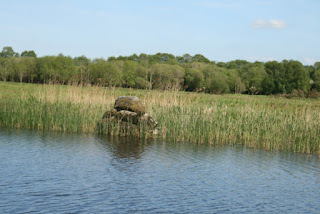 Thomas Roche wrote, "Portumna, a sleepy old town, grew under the shadow of the old castle walls of the great Clanicarde. The old castle is in ruins. There is a modern building which has not been completed. Local tradition has it that because of some wrong done the people, their venerableold priest cursed the place and prophesised that it would never be finished. 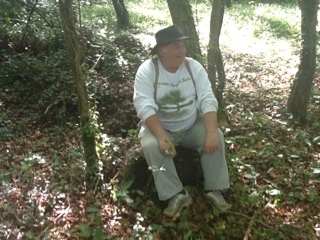 But the wooded demense is delightful. Fine old trees grouped thickly on a vivid green sward. Red deer, half wild, add life to the scene and immense beds of reeds in the coves shelter flocks of wild duck." This is lowland country, wide sluggish river, a few copses of woodland. Cormorants, swans and herons are hunting for food in their own unique ways. 4:55 pm we arrive at Victoria Lock. 5:30 pm, he's back, may have come back from the pub? There is a sudden change of landscape from here on, more lush, seemingly more manicured with healthier taller trees, greener grass and not endless huge fields of cows broken up by struggling woodlands and reed beds. This is also an area of dotted old country cottages and the occasional curious horse. 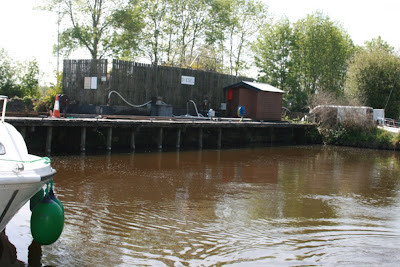 From Victoria Lock the map says were are near Meelick and shows a variety of ancient sites but we see none of these. 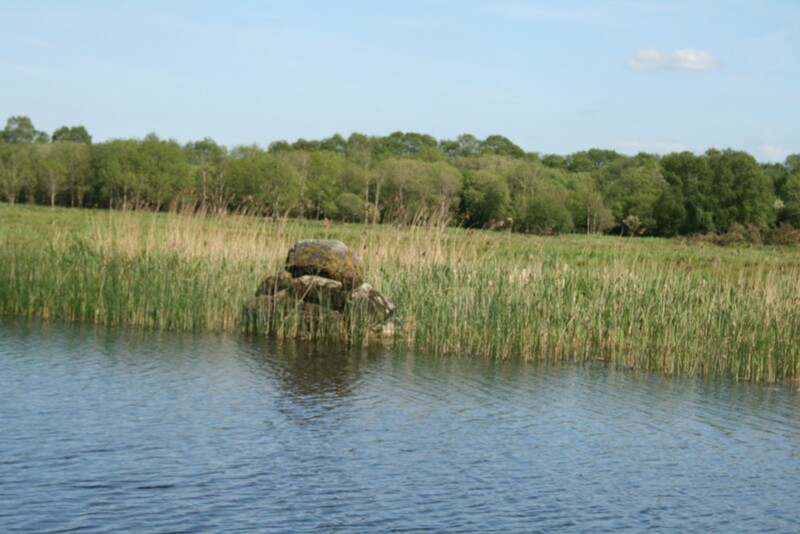 Thomas Roche wrote of here, "By deeply wooded shores and quiet pools we reach Meelick of the low flat islands, the haunt of wild fowl, a favourite feeding ground for snipe, and that delightful bird in his plumage and in his comforting qualities, hot from the spit, the golden plover". 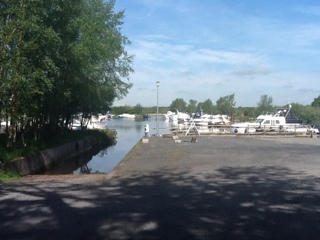 We did not stop at Banagher, but it looks like an important town for the boating world here. In 1927, Thomas Roche wrote "We stopped at Banagher to replenish stores and petrol. The town is long and straggling. I believe it was a bustling place in the old days famous for its horse fairs, whiskey distilled locally and faction fights"
I think we may stop by here on our return in a couple of weeks or so, to see how it may have changed. Maybe in in 84 years time someone will do this adventure again and explain how we found Banagher to be like a Florida spring break town. 8:15 reached second Shannon Harbour lock, decided we had had enough and moored up in the only remaining space available.